Arrive at Mumbai airport or station. Transfer to hotel. Check in and relax for the evening. Mumbai's skyline is recognisable in advertisements and pictorial depictions stating the country's technological and financial hub. It's an imposing skyline. The contours are hazy but the residents don't seem to mind. They love this place and this all-encompassing love is infectious. What are the few nail on the head characterisics of the city? A walk on Marine Drive, The Gateway of India, Warden Road, University Buildings, Fort, Townhall, Mumbai High Court to name a few. The waves splash against the embankment establish an essence of Mumbai too, much in the same genre as the skyline. The pub and bar scenario here is quite state of the art and ranges from the sophisticated ones in the five stars to the hip and trendy ones in Colaba and the suburbs. Mumbai is also known as the Hollywood of India or Bollywood (from the names Bombay and Holywood) and is the biggest film industry of the world. Breakfast will be at hotel or onboard the aircraft. Relax in the morning or visit the local market. Transfer to airport for flight to Aurangabad. The city of Aurangabad was founded in 1610, on the site of a village, Khirki by Malik Ambar - the Prime Minister of Murtaza Nizam Shah II . When Fateh Khan, Malik Ambar's son turned successor in 1626, he gave the city the name 'Fatehpur'. Later in 1653, when Prince Aurangzeb became Viceroy of the Deccan, he made the city his capital and called it Aurangabad. Aurangzeb added the walls that enclose the central part of the city in 1686 in order to withstand attacks from the Marathas. There are four principle gateways to the city - the Delhi Darwaza, the Jalna Darwaza, the Paithan Darwaza and the Mecca Darwaza. Nine secondary gateways also formed a part of the defensive system of this city. 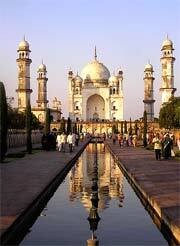 Aurangabad district has always been a prominent region on the Deccan plateau. Having been inhabited since the Stone Age, it has a long artistic and cultural history - to which several dynasties have made major contributions over the years. Maurya rule marked the arrival of Buddhism in Maharashtra. Aurangabad today is a bustling city of Maharashtra with diverse big and small industries, fine silken textiles, and exquisite hand woven brocades of silver and gold fabrics, Himroo of world frame. To scholars and lovers of art and culture the city is more familiar as the gateway to the ancient caves of Ajanta and Ellora, both famous as treasure houses of Indian art and sculpture. Overnight will be at Aurangabad. Proceed for a full day sightseeing with excursion to Ajanta Caves (Closed on Mondays). Ajanta caves: Nestling in an inner fold of the Sahyardi hills, 100 km from Aurangabad in the shape of a mammoth horse- shoe, are the 30 rock-hewn caves of Ajanta. The Caves date from the 2nd century BC. Discovered in 1819 by a group of British army officers, these startling achievements took around 600 years to create. Carved with little more than a hammer and chisel, Ajanta, once the retreat of Buddhist monastic orders features several 'chaityas' (chapels) and 'viharas' (monasteries). The exquisite wall and ceiling paintings, panels and sculptures of Buddha's life are famous throughout the world as the earliest and finest examples of Buddhist pictorial art. Return to Aurangabad and overnight will be at Aurangabad. Proceed for a visit to the Ellora Caves, Daulatabad Fort and Aurangabad Caves. Ellora Caves(Closed on Tuesdays): Impressive in their own right is the rock-hewn temples and monasteries of Ellora that lie just 30 km away from Aurangabad city. In all, there are 34 cave temples, 12 Mahayana Buddhist caves (550-750 AD), 17 Hindu caves (600-875 AD) and 5 caves of the Jain faith (800-1000 AD) 22 more caves, dedicated to Lord Shiva, were recently discovered. Kailash Temple (cave16), the central attraction at Ellora, is the most remarkable. Chiseled by hand from a single massive rock, it includes a gateway, pavilion, courtyard, vestibule, sanctum sanctorum and tower which bear testimony to the excellence of Dravidian art. It is believed to have taken 7000 laborers, working in continuous shifts and 150 years to build. Ever since the first European visitors in 18th Century, Ellora has attracted chroniclers, antiquarians, scholars and in more recent years, ever- increasing number of tourists. Aurangabad Caves: The almost forgotten caves of Aurangabad lie just outside the city. Excavated between the 2nd and 6th century AD, they reflect Tantric influences in their iconography and architectural designs. In all there are nine caves which are mainly viharas (monasteries). The most interesting among these are Caves 3 and 7. The former is supported on 12 highly ornate columns and has sculptures depicting scenes from the legendary 'Jakata' tales. Cave 7 with its detailed figures of bejeweled women also has a dominating sculpture of a 'Bodhisattva' praying for deliverance. Daulatabad Fort: Once known as 'Devgiri', this magnificent 12th century fortress stands on a hill just 13 km. from Aurangabad. It was given the name Daulatabad, the 'City of Fortune', by Muhammad Tughlaq, Sultan of Delhi. Initially a Yadav stronghold, it passed through the hands of several dynasties in the Deccan. One of the world's best preserved fort of medieval times, surviving virtually unaltered, Daulatabad yet displays the character that made it invincible. This is a fortress that was conqusubterranean passages lie coiered only by treachery. A series of secret, quizzical, led like a python amidst the fort. Here flaring torches were thrust upon an unwary enemy. Or hot oil poured down his patih, as he deliberated n the labyrinth. Also the heat from a brazier was blown into the passage by a process of suction suffocating the entire garrison within. The fort itself lies in the body of an isolated hill; the steep hill - sides at the base falling so sharply to the moat that no hostile troops could scale the height. The moat, 40 ft. deep with mechanical drawbridges teemed with crocodiles. A 5-kilometer sturdy wall, artificial scarping and a complicated series of defenses made Daulatabad impregnable. The 30-meter high Chand Minar (Tower) built much later with 3 circular galleries had a defensive and religious role in the fortress. 0vernight will be at Aurangabad. Reach Mumbai and transfer to hotel. Proceed for an excursion to the Elephanta Caves. On your way back, proceed to see the interesting sites of Mumbai. Transfer in time to international airport for flight home. 05 nights accommodation on single occupancy basis. All transfers and sightseeing and tours by private Air- Conditioned Ambassador car or similar. Local English speaking guide during the sightseeing. Boat ride to Elephanta caves .